Not sure about you but I’m fussy when it comes down to clearing waste, I can’t stand the sight of litter strewn around the place. 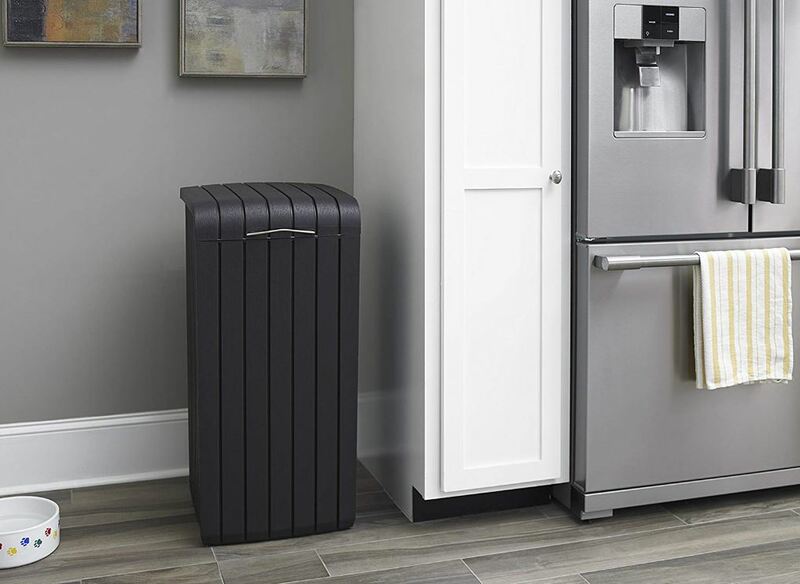 The Copenhagen effectuates the disposal of waste in a simple hygienic manner, courtesy of delivering wide access at arm’s length due to the 33.3-inch tall slender body shape comprising a 15″ x 15″ swing-open lid and easy-to-sterilize polypropylene manufacture. Admirably stylish for stand-alone use in kitchens, porches & garages meanwhile modishly presentable for locating on the BBQ deck & patio, around the swimming pool and urban balconies. The structure exhibits the likeness to wooden textures courtesy of showcasing deep rich tones and grain for the purpose of complimenting indoor decors & outside furniture. 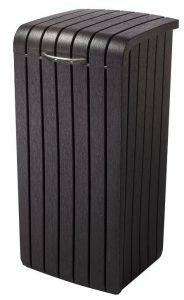 Outdoor waste-bins are such a handy piece of kit to have whilst entertaining friends & family. Whether you’re snacking, drinking, barbecuing or alfresco dining, it takes seconds to open the lid & dump the rubbish; Out of sight – Out of mind, for my concerns. We typically chuck food-waste in one bin and use another for recyclable products such as tins, cans, plastics & cardboard. Our Refuse Collection requires households to segregate recyclable products from food waste using 2 wheelie trash bins, therefore, this method simplifies the process. 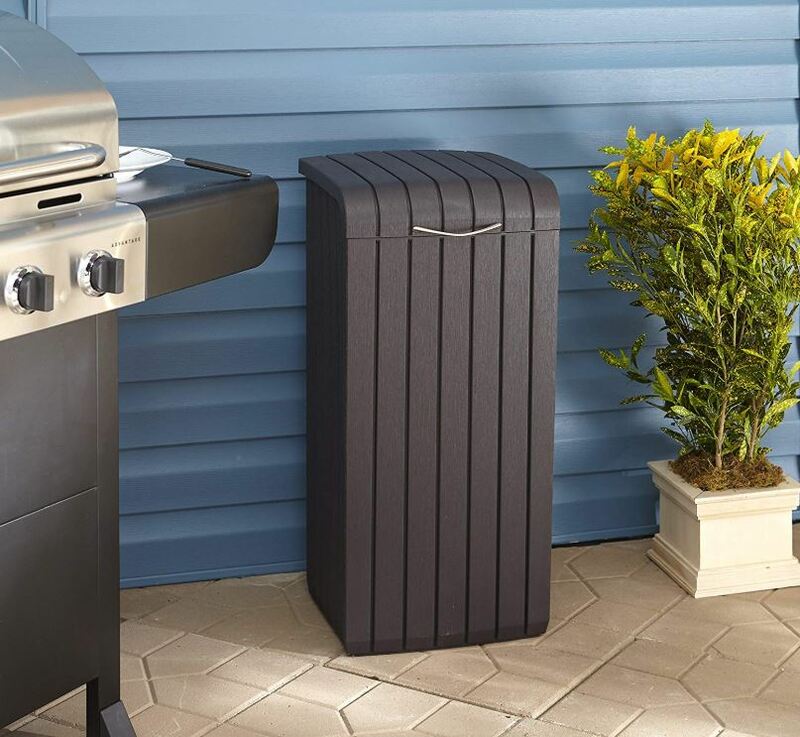 Keter manufactures a few different styles of waste bins for outdoor use, they supplement outdoor food prep stations a treat. 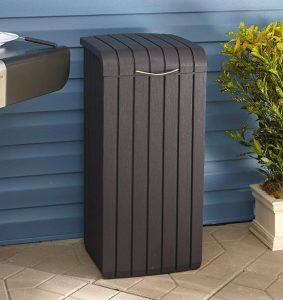 This waste-bin has achieved super-star status in the USA, receives exceptional feedback and has acclaimed to the dizzy heights of Amazon’s Global Store whereby they ship worldwide, although you will be subject to delivery charges outside America. 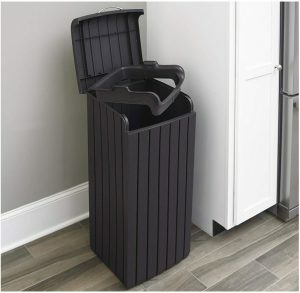 Externally the bin measures 15 inches wide x 15 inches deep x 33.3 inches high. An ideal size when comparing how strong most trash bin liners are nowadays unless you’re able to purchase the heavy-duty designs. There’s nothing worse than waste bags splitting and creating a smelly mess. Accessed by a sleek metal handle and functioned by a metal hinge, the lid swings back just beyond 90 degrees to overcome falling closed, attaining fully opened access for dumping trash. A removable resin-rim sits at the top of the bin for securing bin liners. Simply wrap the top of the trash bag around the rim and place it back into its seating position, this supports the refuse weight. 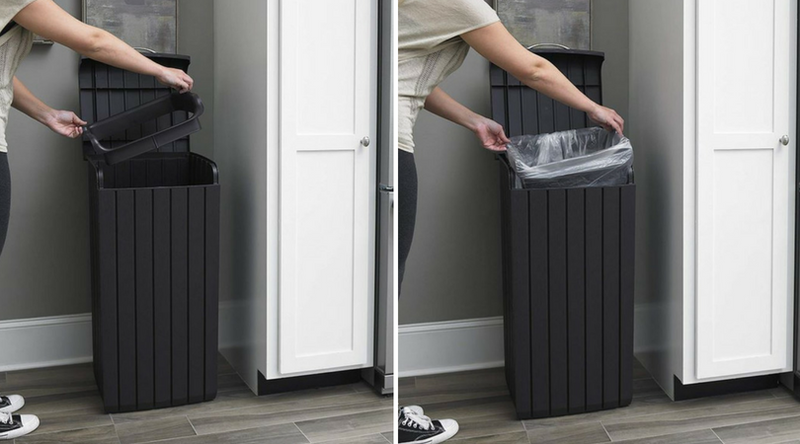 The bin accommodates 30 gallons of storage therefore suitable bin-liner sizes are around the 30-39 gallon size. Once the lid swings open fully ajar, hauling the refuse bag out of the bin presents no difficulties due to the broad-access lid and straight slender design. The solitary installation step required once you remove the waste-bin from the delivery box regards fitting the handle. Satisfying environmental concerns, Copenhagen’s manufacture constitutes recyclable polypropylene therefore when the time comes to replace the bin for a newer design in the future, the make-up can be re-moulded into the next generation of polypropylene products. Deep espresso coloured pigments blend in with the polypropylene to exhibit the richness of dark wood meanwhile UV inhibitors armour the manufacture against the scorch of sun-rays bleaching, fracturing, blistering & peeling. After mixing the manufacture, state-of-the-art moulding techniques create a chunky fascia, producing ridges to the internal side for sturdiness simultaneous to producing the mirror image of wood, displayed in deep vertical panelled formation with an embossed impression of textured grain, further to developing a modish curvy lid. The lid’s sufficient overlap of the sides, flush frontage and curvy design ensures rainwater promptly drains away meanwhile polypropylene endures all weathers including sleet, snow, rainfall, damp and humid conditions without being susceptible to rot & corrosion. This type of resin remains immune from decomposing. Copenhagen’s make-up is designed for every-day wear & tear, it doesn’t require conserving with repeatable coats of varnish; maintenance merely entails a clean when waste-refuse contaminates & stains the fascia. Either washing inside & out with a damp cloth or soft bristled brush including a squirt of detergent or white vinegar hygienically does the trick whereas a swift jet-wash down with the hosepipe freshens back the new condition in minutes. Copenhagen’s appealing espresso shaded wood panelled simulation complements inside decor’s & outside spaces with a modishly designed curvy flush top lid & presentable eye-appeal meanwhile crucially for waste services, it’s a cinch to hygienically clean, inside & out. 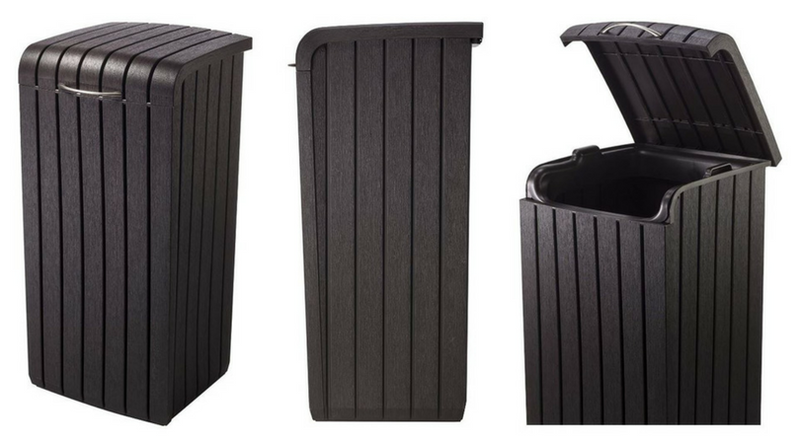 The 33.3-inch tall slender design comprises a 15″ x 15″ swing-open lid and removable rim that seats to support bin liners, delivering convenience for the disposal of rubbish in addition to hauling bags out during emptying. Accessed by a sleek metal handle, the lid swings ajar functioned by a metal hinge meanwhile upon closure the lid’s curvy top sits flush at the front in addition to slightly overhanging the sides, producing a weatherproof design. Manufactured for every-day wear & tear, the admirably stylish UV fortified polypropylene subsists driving rain to scorching sunshine and damp conditions in between, without being susceptible to deterioration through weather decay therefore perfect for use both indoors and outside. 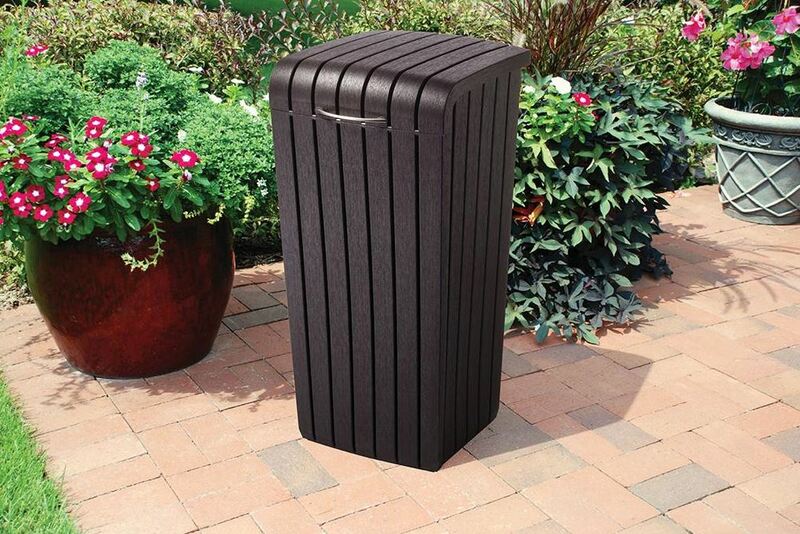 Hope Copenhagen’s slender outdoor patio trash bin inspires ideas for disposing of your household waste. Share your favourite weatherproof waste bin below along with any Copenhagen queries; a pleasure to help. Please share Keter’s Copenhagen. Thank you.